The muted decor is a backdrop for conversation in the third-story restaurant which overlooks the Californian lushness of San Diego. The server brings you your choice of excellent wines, exotic cocktails, beer, or unique beverages which are a teetotaler’s delight. As you ponder the choices on the menu, another server brings you a ceramic demitasse of amber-colored chicken consomme. As the flavorful, complimentary appetizer warms your throat and delights your palate, a petite server sneaks up to your table as though it were the throne of a Chinese emperor. In a soft, cordial voice with an instantly charming Asian accent, he offers you a popover. The crunchy pastry, which is light and eggy inside, proves to be as delicious as the consomme into which you might be tempted to dip it. New York department stores are noted for their fabulous in-store dining options, but Southern California is never far behind the East Coast. Fashion Valley, an outdoor shopping center minutes away from San Diego’s famous destinations, is filled with high-end department stores which feature gourmet restaurants right inside. The finest of these is the Zodiac in Neiman Marcus. 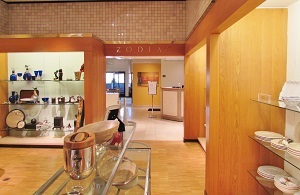 The Zodiac is nestled in the corner of Neiman Marcus’s top floor. It is never very busy, so you won’t have to wait for a table. You can eat inside or on the shaded terrace, which is pleasant year-round. You can start your meal with the day’s soup, a traditional shrimp cocktail, or a more unusual appetizer such as the beef and green chile quesadilla or the smoked salmon pizza. 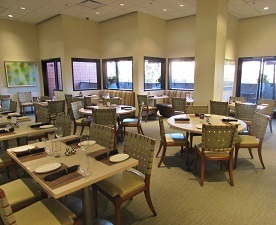 The menu features eight composed salads, including vegetarian options or choices topped with seafood, chicken, or beef. It also has eight sandwiches, which showcase cleverly blended flavor combinations on croissants, tacos, and hamburgers. In addition, there are six main selections, including the tender, succulent trout amandine. If you want to experience a really chic, exceptional dish, try the Zodiac’s specialty, the mandarin orange souffle. 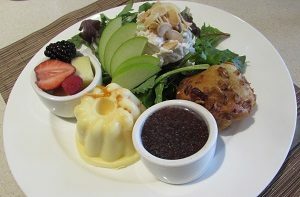 This sweet, jello-like citrus souffle is accompanied by a chicken salad with shaved almonds, seasonal fruit, and the daily sweet bread. The Zodiac is somewhat expensive, but the service and atmosphere are worth the prices. The starters are $13 to $15, the composed salads cost $19 to $28, the sandwiches are $16.50 to $19, and the main selections cost $20 to $28. The best value is Today’s Sampler, which features a cup of the daily soup, half a chicken or tuna salad sandwich, and a bowl of fruit for $17.50. No matter what you have for your main course, you’ll want to spend another $8 on one of the Zodiac’s desserts, which include a Boston cream pie, an apple torte, a cappuccino ice cream pie, and a mocha crunch cake. For $7.50, you can have a goblet of smooth, creamy, delectable Niederfrank’s ice cream or sorbet, which comes in many flavors. A box of Neiman Marcus cookies costs only $5.50. These desserts may be accompanied by a cup of hot or cold-pressed coffee or one of the large assortment of Dammann Freres teas. Neiman Marcus is at 7027 Friars Road in San Diego. You can see the restaurant’s full menu at neimanmarcus.com/restaurants. Call 619-542-4450 to get more information or make a reservation, though one is hardly necessary. The Zodiac opens at 11 a.m. every day except Sunday, when it opens at noon. Don’t come too late, since the restaurant closes at 4 p.m. every day. The Zodiac is an oasis of fine dining and exceptional service in the midst of high fashion.